This book and its follow-on were part of the required reading curriculum for one of my first journalism classes. 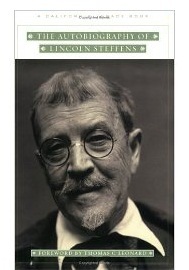 Through his description of his rookie reporter days, Lincoln Steffens had a profound impact on my appreciation of the power of the written word. Over the years, I pushed this book on most of my family to try to give them the same perspective. Now I’m sharing this with you, too. Riis told him about it, how I got him called down by printing a beat, and he had to get even. And did. “I beat the pot out of you,” he boasted to me, his pride reviving. “And I can go right on doing it. I can get not one or two crimes a day; if I must I can get half a dozen, a dozen. I can get all there are every day. And Riis, the honest, told us how the reports of all crimes of high degree against property were sent in by the precincts to the heads of inspection districts and they were all compiled in a completed list which was filed in a certain pigeon-hole in the outer office of the chief inspector. Not he, but his boy, Max, had observed the making and filing of this list one day long ago; he had reported it to Riis, who resisted temptation to some extent. Members of the news-reading public only saw that the number of stories reported via competing papers had jumped dramatically, and began agitating all the local politicians to fix this ill. The fact that the actual number hadn’t changed didn’t play into the equation. It’s a powerful story about how additional information shifts the picture kaleidoscopically. I may not now be a practicing journalist, but the training I received all those years ago has still stood me in good stead. In particular this book and it’s engaging anecdotes about never being satisfied with the first or easiest answer is a useful guideline for my everyday life. And even my life as a story teller. So I can whole-heartedly recommend this book to anyone else looking for a little perspective on how additional information can shift a picture. Excellent review! I feel as though I know exactly what I’ll get if I decide to buy this! Thanks for leaving your link on G+ for folks to find you and follow!